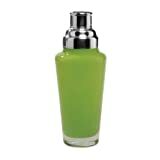 Add a little lime to your drink with this bright green martini shaker! The bottom is made of glass, with a detachable metal strainer and cap. It holds 25 fluid ounces and stands 10.5 inches tall. A fun piece of barware that is a great gift idea!